The Puffing Billy Railway we know today is one of Australia's top tourist attractions, with visitor numbers that are the envy of similar preserved railways around the world. Originally built, owned and operated by the Victorian Railways as part of the State?s railway system, the 18.2 mile [29.3 km] Upper Ferntree Gully to Gembrook line was always a scenic attraction to the people of Melbourne, who travelled on excursion trains for day trips and weekend holidays in the hills from the time of its original opening in 1900. 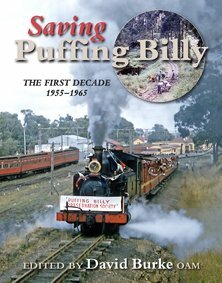 The present-day success of Puffing Billy has evolved from the humble beginnings of its rescue by the Puffing Billy Preservation Society in mid-1955. The narrow gauge railway had outlived its usefulness as a general rail service to the hilly district through which it ran and it had been officially closed in 1954. Saving Puffing Billy is a fascinating story of public sentiment for the railway giving rise to the formation of the Puffing Billy Preservation Society in 1955 and the saga of rescuing the line from imminent scrapping; the restoration phase; the re-openings to Menzies Creek in 1962 and to Emerald in 1965 - all within the Society's 'First Decade 1955-1965'. Edited by former Young Sun editor and renowned author, David Burke, this book of 200+ pages is based on extensive research and writing by PBPS member Bill Russell, enhanced by ‘human interest' interviews with a representative number of long-standing Society members. Well illustrated with 300+ photos and other graphic items, most of them in colour, the book is being produced as a high quality, hard cover work that will be a 'must' for anyone who has an interest in Puffing Billy, historic railways and their preservation generally.